- Cut the lemongrass stalk into 1-inch pieces and smash them with the side of a large Chinese cleaver, a pestle, or any heavy object lying around in the house; set aside. - Do to the chilies what you just did to the lemongrass; set aside. - Remove the stems and the tough veins that run through the middle from the kaffir lime leaves, and tear them up into small pieces. You can also bruise them a little. Set aside. - Put the coconut milk into a 4-quart pot, followed by concentrated chicken stock, kaffir lime leaves, lemongrass pieces, and galangal slices. - Bring the mixture slowly to between 160'F and 180'F (slightly below a simmer), allowing the herbs to infuse the liquid. - Keeping the temperature steady, add the mushrooms and the chicken to the liquid; adjust the heat to maintain the temperature. The liquid should never at any point come to a rapid boil. Don’t worry; at 160'-180'F, your chicken will be thoroughly cooked. - Stir gently to ensure that the chicken is evenly cooked. - Once the chicken is cooked through, throw in the smashed chilies and remove the pot from heat immediately. - Add the juice of 2 limes and the fish sauce to the pot, stir, and taste. Add more lime juice and fish sauce, if necessary. The soup should be predominantly sour, followed by salty. The sweetness comes from natural sugar in the coconut milk. 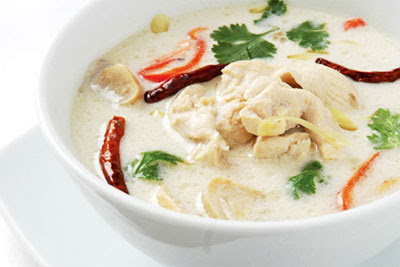 - Stir in the cilantro leaves and serve your tom kha gai with steamed jasmine rice as an entree.